Explore the complex layers of Israel and Palestine with your community on a trip that will be spiritual, thought-provoking, and inspirational. A trip that includes a mixture of angles – spiritual, political, cultural, historical, geographical, and more. A trip with complexity and nuance, where learning happens through encounters with people, exposure to multiple narratives and perspectives. A trip which makes time and space for reflection and fun. Trip participants will learn deeply and emerge with a deeper understanding of the people of Israel and Palestine and of themselves and their relationship to the land and the State of Israel. They will make substantial connections with one another. They will bring their experiences back to the community in a way that makes a lasting and positive impact. The people – Jewish Israelis, Arab Israelis, Druze Israelis, Ethiopian Israelis, Jewish religious settlers seeking peace, secular Israelis and Palestinians working for peace and their inspiring organizations. We hope to cultivate some learning partnerships over the coming year with Israelis who we will meet on our trip. 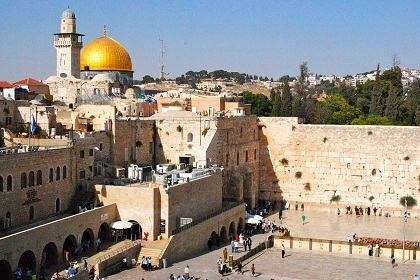 The places – Jerusalem and Tel Aviv for Shabbat – ancient ruins and bustling markets, sacred spaces and security borders, Tzfat and the Sea of Galilee, the Dead Sea and beautiful natural spaces – desert and mountain. Unique Experiences – Or Shalom services at the kotel, a trip through a security checkpoint between Jerusalem and Bethlehem with a Palestinian guide, a visit to the Bedoin community, a graffiti tour in Tel Aviv – our trip will include dimensions we could not access on our own. *Please note that these are draft documents and will vary slightly as the trip is finalized. Learn more about Reconstructionist perspectives on Israel and Palestine in Reconstructing Judaism's newly launched project, Evolve: Groundbreaking Jewish Conversations.